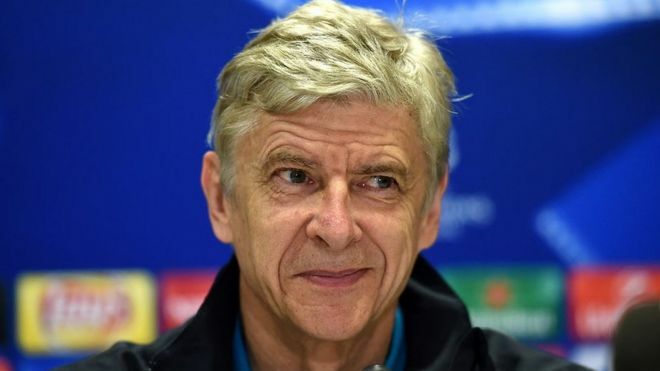 Arsenal’s manager Arsene Wenger has seemingly been duped by false reports that former football star George Weah had won Liberia’s presidential election, even though the final results have not yet been announced. He coached Mr Weah at French club Monaco in the 1990s. Mr Weah was among 20 presidential candidates in Tuesday’s election. The former Fifa World Footballer of the Year failed in his two previous attempts but is one of the front-runners to replace President Ellen Johnson Sirleaf. However, most analysts expect it to go to a second round, as a candidate needs more than 50% of the votes for outright victory. False reports of Mr Weah’s victory about have been circulating on social media but it is not clear why Wenger thought he had won. “It is not often that you have a former player who becomes a president of a country,” Wenger said. “Well done George and I would say just for him to keep his enthusiasm and his desire to learn and to win,” he added. Official results have still not been announced even though the head of the National Elections Commission (NEC), Jerome Kokoya, had told the BBC that he expected the first results to be announced by 23:00 GMT on election night. One of Liberia’s leading political parties, the Liberty Party, has called for a halt in announcing results, citing alleged irregularities. At Arsenal manager Arsene Wenger’s press conference, I asked him whether he was surprised that his former player, Kolo Toure, had made the transition to assistant coach for Scottish side Celtic and the Ivory Coast national team. In his response Mr Wenger chose to first congratulate another of his former players, George Weah on “becoming the new president of Liberia”. For a moment I thought he had received a call from Weah confirming the result of Tuesday’s presidential election. I knew the official results were not yet out but I thought Wenger may have better intelligence than me. His eyes were glinting, and he spoke with much excitement and a genuine congratulatory feel. Wenger and Weah share a very special relationship and I would not be surprised if the Arsenal manager goes to Liberia for Weah’s inauguration – if he wins.